It’s not new, it’s been around for over 40 years, appeared in the early 70’s under the Hysol 1942 banner then in 1974 it became the original flagship grade within the Tecbond range, and today is still solving sticky situations. 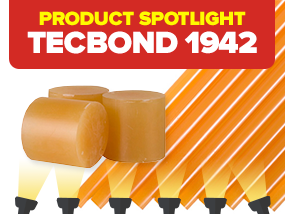 Tecbond 1942, the glue stick that the Power Adhesives business was founded upon is a hot melt adhesive with an aggressive molten tack for problem solving applications. It exhibits excellent adhesion to wood, nylon, ABS, ceramics, light gauge metals, fibreglass and various plastics, such as nylon, polycarbonate, rigid PVC, polystyrene, and acrylic. Used commonly for product assembly applications often where good heat resistance (80c) is required. Due to the natural resins used to make this product and depending on their global source, it is sometimes useful to reduce the glue guns temperature to 180˚C to prevent excessive dripping. We recommend to apply 12mm glue sticks with the Tec 820-12 glue gun and the 43mm glue slugs with a Tec 3400 using the 180 c thermostat if required. Incidentally, Tecbond 23 is the nearest possible modern day copy of the original Tecbond 1942 grade using synthetic polymers and resins rather than the natural ingredients used to make Tecbond 1942. Tecbond 1942 has survived the test of time and is still providing the answer to gluing problems around the world. Want to try a sample, give us a call on 0161 627 1001 and our friendly sales team will be pleased to assist.